Norway Does A Ctrl+Alt+Delete On E-Voting Experiment : The Two-Way After trying out online balloting in elections in 2011 and 2013, Oslo has concluded that it didn't improve turnout and might undermine the democratic process. During the 2013 elections, online voting was an option in Norway. 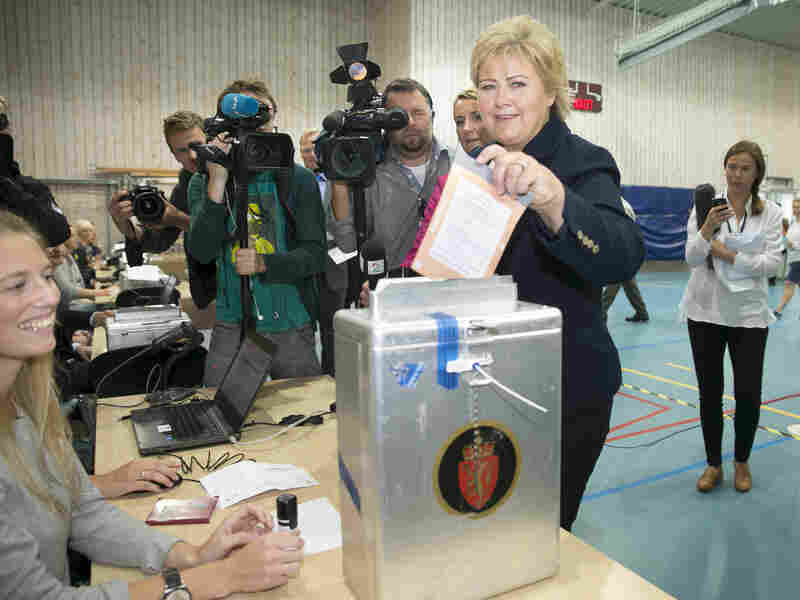 Even so, Erna Solberg, chairman of the Conservative Party of Norway, casts an old-school ballot. After a two-year trial for Internet voting, Norway is pulling the plug. The country's Office of Modernization said in a statement that there's no evidence that online voting, tested in elections in 2011 and 2013, improved turnout. It also said that "political disagreement" over the issue, along with voters' fear that ballots might not be secure, could undermine the democratic process. The office said it had "decided that the attempt with voting over the Internet should not be promoted." The idea of online voting has been in the ether for as long as the Internet, so Norway's experience might be relevant elsewhere. It seems to have worked in a few places, such as Estonia, where citizens have been clicking to vote since 2005. According to Thad Hall, a political scientist quoted by The Washington Post: "Surveys have found that Estonians view their system as being very effective. ... They have high confidence in it. They like it." And the question of whether it's a viable option for the United States has come up in numerous articles over the years. David Jefferson, a computer scientist at Lawrence Livermore National Laboratory, wrote in 2011 that "computer and network security experts are virtually unanimous in pointing out that online voting is an exceedingly dangerous threat to the integrity of U.S. elections. "There is no way to guarantee that the security, privacy, and transparency requirements for elections can all be met with any practical technology in the foreseeable future," he says. And in 2012, the MIT Technology Review published the paper "Why You Can't Vote Online," in which it concluded that fundamental security problems had yet to be solved. "The unsolved problems include the ability of malicious actors to intercept Internet communications, log in as someone else, and hack into servers to rewrite or corrupt code," wrote the paper's author, David Talbot. "While these are also big problems in e-commerce, if a hacker steals money, the theft can soon be discovered. A bank or store can decide whether any losses are an acceptable cost of doing business," he said. "Voting is a different and harder problem. Lost votes aren't acceptable." And, just this month, an unofficial referendum on freedoms in Hong Kong was criticized by Beijing for (among other things) being open to manipulation because it has an online voting option.